Do you get nostalgic for old Delta planes? I always check out Delta PR video’s through the official Delta YouTube channel but the other day when I was surfing around, the suggested videos “I may like to see” was the one below showing some of the old birds Delta has flown over the years. Boy did it bring back memories from my youth. While Delta no longer flies 727’s anymore, they are still up in the air. Also, I am proudly a 25+ year ex-smoker and thus one who is the most easily offended by smoke! I remember being a smoker and smoking on airplanes. I also remember hating the smell when I was younger. My fellow BA blogger Frequent Flying has some old Delta seat maps of what it was like back in the day. Delta also has tons of information online about the history of Delta and Delta Jets at the Delta History museum page. 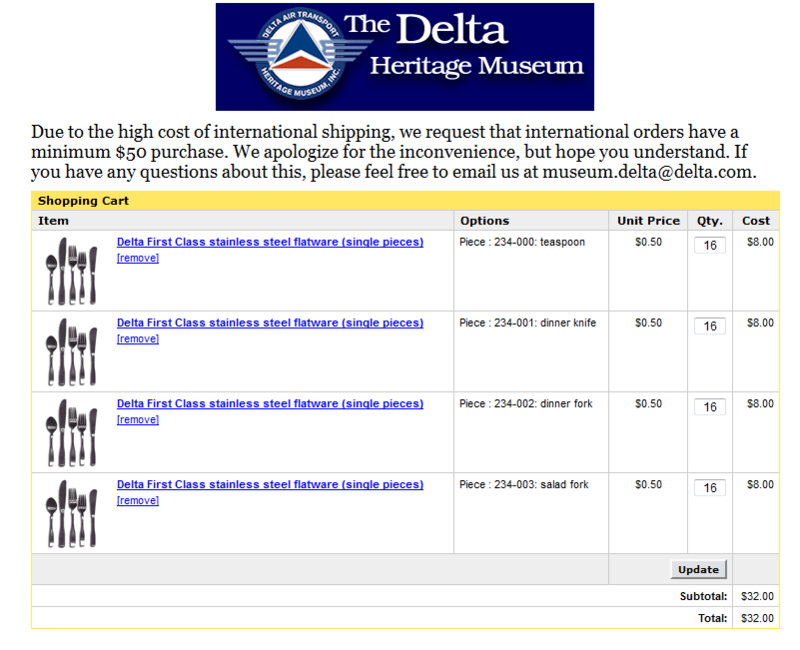 And if you get nostalgic, or just want to save some money on a set of flatware, and miss the Delta branded first class utensils, you can order a 64 piece set right now for just $32 plus s&h! Seriously? ← Why you should always buckle up! Extreme turbulence! The 727 where the MD-80 series’ competition, which are still in use today by Delta. I’m proudly traveling on an MD-88, this Friday FLL-LGA. I believe most have been kept up to date and even have WiFi on board. I miss NW DC9-30s, DC10 domestics, and BAE 146s. a little change of subject — I always fly ath-jfk-ath and the so called tax in biz class was around $400.00, it killed me when I knew that jfk-ath-jfk was next to nothing — now trying to book my reg ath-jfk-ath and the SO CALLED TAX ETC IS $758.00 — I can go with BA who has the reputation for being the biggest gouger for”only” $ 600.00 — why many hate delta! I remember the old L-1011 with a nostalgic fondness. A flight on one meant you were going someplace exciting! think i will re try tomorrow to see if today is a glitch –i doubt it!! I still remember the days when Delta Jets was synonymous with Douglas Aircraft. DC-8, DC-9 were the core aircraft of the Delta fleet. Boeing didn’t come until the 1970s. I think that’s why so many people hate to see l the MDD aircraft moved out. Fondest flights were on Northeast B-727’s BOS-MIA 10pm south bound on Fridays and 10pm on Sundays returning. More “modern” flights were on the Delta Song B-757 flights from BOS-FLL/TPA/RSW. Was on the first one to TPA. The most fun were the Atlantic Coast BAE-146 flights BOS-PHL. Made those so often I got to know the crews and wound up doing the in-announcments.